In the fist blog post over using the Azure ARM REST API I explained how to retrieve the Access Token needed for the further authentication against the Azure ARM REST API. In this blog post I’m going to explain how you can use that Access Token and start communicating with Azure using simple web calls. How to use the Access Token for Authentication? It took some time to find the correct location about how to use the Azure REST APIs but a good starting point is the Azure Reference on MSDN. The interesting part for us is how the Request Header should look like. Ok now we know how to use the Access Token we can start with a simple get info about the Azure Subscription. And again you can find info on retrieving that info on the Azure Reference links. For retrieving the Subscription information we need to use the following request URI. Let’s do a web request call using PowerShell Invoke-RestMethod cmdlet first. 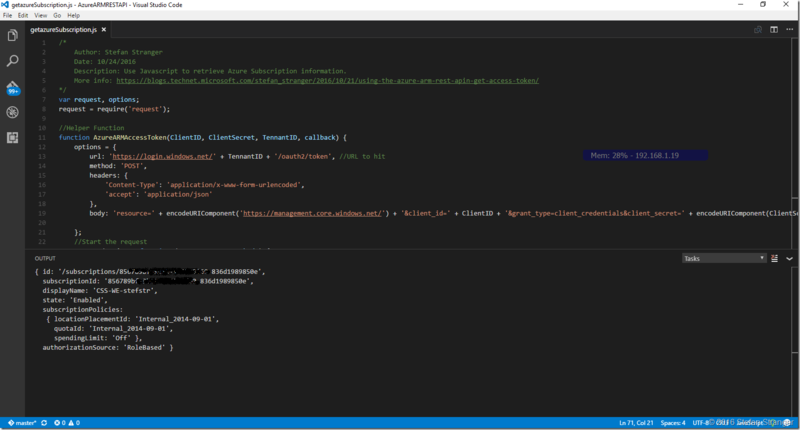 # Description: Get Azure Subscription Info using plain REST API calls. When running above PowerShell script we receive the following info about the Azure Subscription. Because we are using plain REST API web calls we can use all kind of tools, like for instance Bash scripts. As you know Microsoft Loves Linux and we can use Bash on Windows (if you are on the Windows 10 Insider builds) to create a Bash script and use Curl to retrieve the Azure Subscription information. I installed jq, a lightweight and flexible command-line JSON processor to parse the JSON output from curl, using apt-get install jq on Bash on Windows. curl -s --header "authorization: Bearer $accesstoken" --request GET $subscriptionURI | jq . I hope the above examples showed why it is cool to use Azure (ARM) REST APIs to manage Azure. In the next blog post I’m going to explore the Azure (ARM) REST API a little more.